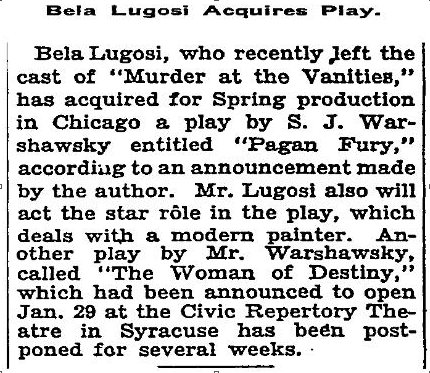 Sam J. Warshawsky’s play Pagan Fury was to be the first production of Belian Productions, a production company formed by Bela Lugosi with his wife Lillian. Ultimately, Lugosi was unable to raise the necessary funds to stage the play. Officially incorporated in February 1934, none of Belian Productions’ proposed productions were realised. 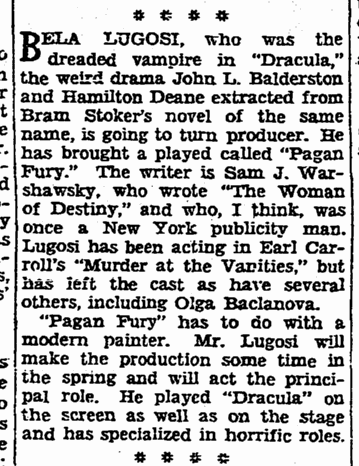 Bela Lugosi will assume the star role in Sam Warshawsky’s play, “Pagan Fury,” which is slated for spring production. ACTING UNDER the green spot……..must be gloating glee for that mysterious gent Bela Lugosi……..This stage and screen diabolist……..has just removed himself from “Murder at the Vanities”……..to……..”Pagan Fury”……..a sweet little cut-throat tome……..by that peaceful citizen Sam J. Warshawsky……..who learned playwriting in the RKO publicity department……..Sam’s play opens in Chicago soon……..and as we read his first dittie “The Woman of Destiny”……..we predict that much will be left on the cutting room floor……..after the screen adaptations are made……..
New York – Bela Lugosi has acquired a play with Spring production planned for Chicago. It is “Pagan Fury,” by S.J. Warshawsky, and Lugosi will star.